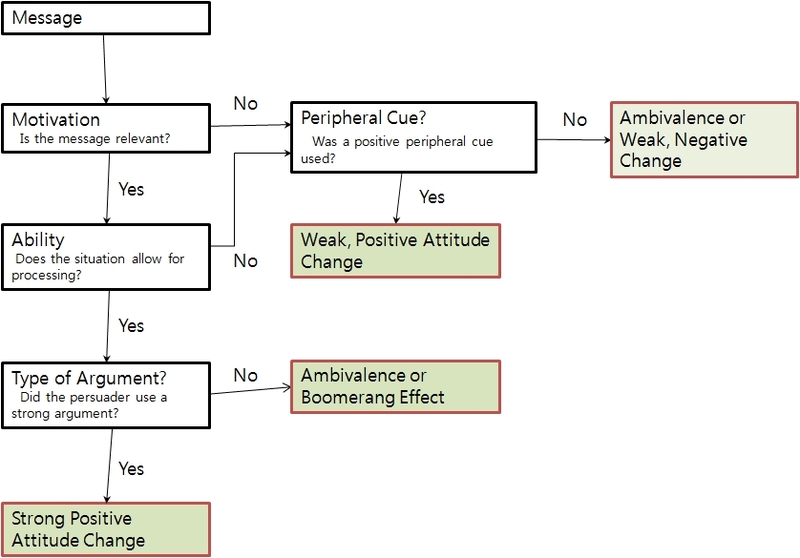 Thoroughly study the Elaboration Likelihood Model below. In ELM, the central route of persuasion is triggered if you process a message positively all the way through (or straight down the first column). The peripheral route of persuasion is triggered if you have any negative responses to the message. 1) What specific aspects of the ad trigger the central route for you? 2) What kind of response does each aspect elicit? 3) Why do you think each elicits the response that it does? 4) How could your team apply the persuasive triggers from your selected ad to your PSA? Read and comment on at least 3 peers' posts. Your post and comments are due by 1:45 p.m. Oct. 27.